Shorebirds in the heart of the country? Almost half of all migratory shorebirds nesting in North America migrate through the Cheyenne Bottoms Wildlife Area in central Kansas. 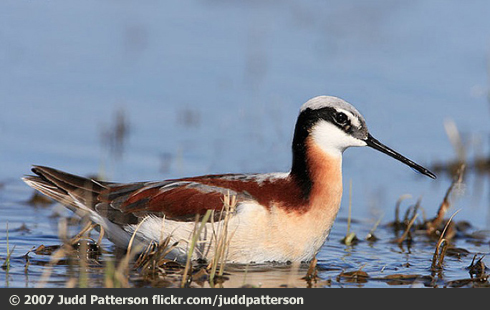 Almost all of the continent's Wilson's Phalaropes rest and refuel at the wetlands here. The birds fly a great oval route. In autumn, in the East, they head from Canada and the Arctic, across the Maritimes and New England, and south down the coast. Then in spring, when shallow wetlands on the Great Plains "bloom" with invertebrates, they fly north through the heartland of the country. Wetland conservation protects stopover points for these and other birds. Almost half of all migratory shorebirds nesting in North America, including the American Golden-Plover we’re hearing, migrate through the Cheyenne Bottoms Wildlife Area in central Kansas. But aren’t they birds of the coast? Well, it turns out they’re flying a great oval route, making use of what nature provides. In autumn, with their long wings and rapid flight, they take advantage of favorable winds. In the East, they head from Canada and the Arctic, across the Maritimes and New England, and south down the coast. Then in spring, when shallow wetlands on the Great Plains “bloom” with invertebrates, they fly north through the heartland of the country. Today’s show brought to you by the Lufkin Family Foundation. I’m Michael Stein. Sounds of the birds provided by The Macaulay Library of Natural Sounds at the Cornell Lab of Ornithology, Ithaca, New York. American Golden-Plover recorded by Gerrit Vyn; Sandpipers recorded by Wilson’s Phalarope by R.C. Faucett; Long-billed Dowitchers by C.A. Sutherland; Stilt Sandpiper by Gerrit Vyn. Ambient drawn from Wilson’s Phalarope recording. Reference: A Directory of Wetlands of International Importance. Ramsar Information Sheet. Ramsar Site 411. Cheyenne Bottoms Wildlife Area - Learn more!